A technique to develop smart posters and clothing, which communicate directly with car radios or smartphones by using background FM radio signals to transform them into mini FM radio stations consuming virtually zero power, has been unveiled by a University of Washington (UW) team. The UW team has demonstrated how to apply a technique called backscattering to FM radio signals. The smart posters or clothes transmit messages using a low-power reflector to reflect and encode audio and data in the signals without affecting the original transmissions. 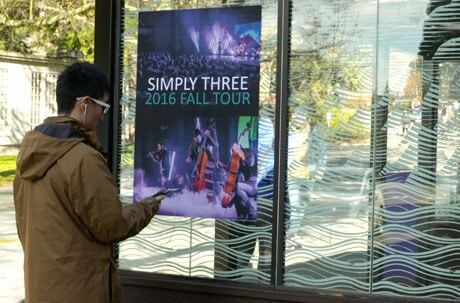 In a series of demonstrations, a poster for the band Simply Three placed at a bus stop sent a snippet of the band’s music, as well as an advertisement, to a smartphone 12ft (4m) or to a car more than 60ft (20m) away. The total power consumption of the system — which effectively turns everyday objects into mini FM radio stations — was 11 microwatts, the team says, which could be supplied by a coin-cell battery for two years, or powered using solar cells. “What we want to do is enable smart cities and fabrics where everyday objects in outdoor environments — whether it’s posters or street signs or even the shirt you’re wearing — can ‘talk’ to you by sending information to your phone or car,” says UW assistant professor Shyam Gollakota. Clothing with integrated health sensors that monitor vital signs and send them to a phone. “The challenge is that radio technologies like WiFi, Bluetooth and conventional FM radios would last less than half a day with a coin cell battery when transmitting,” adds co-author Vikram Iyer. The results of the tests are published in a paper to be presented at the 14th USENIX Symposium on Networked Systems Design and Implementation later this month. In November 2016, Stanford University researchers unveiled a miniature, self-sufficient WiFi device incorporating a processor and radio in one, which they claimed was the “missing link” for the Internet of Things. Named HitchHike for its ability to hitch hike on incoming radio waves from a smartphone or a laptop, it translated those incoming signals to its own message and retransmitted its own data on a different WiFi channel.